The Palais Royale invites you to experience the history and romance of a bygone era. 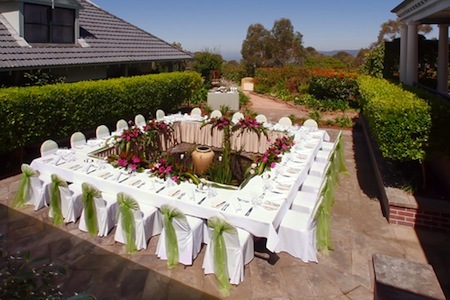 A fully restored luxury boutique hotel, brilliantly situated in the heart of the Blue Mountains, the Palais Royale is the idea venue for a wedding reception. The beautiful 18th Century French-inspired Grand Ballroom is enhanced with original leadlight windows, intricate mirrors and superb chandeliers. Imagine how much more magical your special day will be if you and your guests celebrate in such "Royale" surroundings. Add to this magnificent atmosphere, fabulous cuisine and you have the perfect reception venue. Set on the ground floor, our magnificent Grand Ballroom serves as an exceptional conference venue for groups of all sizes, and comes complete with state-of-the-art facilities and a selection of Conference Menus that can be tailored to suit all tastes. Delegates can enjoy sumptuous morning and afternoon tea in the relaxing Royale Lounge, and lunch and dinner are served in Gazelles – our beautiful restaurant on the lower ground floor. Choose from buffet, canape and plated package options.